The route is suitable for people of different age and physical condition. The exception is people for whom staying outdoors, long walks and excessive physical strain are not recommended for medical reasons. The route is well-maintained with information placards in four languages, wooden duckboards across waterlogged spots, benches for rest, signs prohibiting fishing. The route provides a good opportunity to get acquainted with different types of landscapes: the forests, small lakes and streams, mires and meadows. The trail begins from the sign on the motor road and runs between narrow lakes Upper and Lower Nuris extended in the north-eastern direction. At first the trail passes a gradual elevation with young spruce forest with blueberry undergrowth. Plentiful various lichens adorn trunks and branches of the trees. Then the trail comes to the shore of a lake surrounded by a small mire with typical vegetation: little pines, bushes of dwarfish birch and willow, juniper, wild rosemary, cloudberry and sedge. Next 600 meters the trail runs through a spruce wood. Large anthills can be sighted there. To the north-west the trail is flanked by a steep almost vertical cliff, which marks a deep tectonic fissure. A small waterfall descends this rock wall in spring. A long talus of big rock chunks can be seen at the turn of the trail. This is the evidence of an earthquake that happened here in the post-glacial period about 9.5 thousand years ago. The steep slope and rift extend to the middle of lake Astervajarvi. A grass-covered mire lies to the south-east of the trail. It used to be an alluvial meadow. Remains of a dam can be seen on a rivulet at the narrow end of the mire. A hundred meters to the north-west of the end of the lake the trail crosses a wide clearing, which in 1920—1940 was the state border with Finland. Astervajarvi is a typical small forest lake. Mutkajoki river is its larger tributary. One can see millstones of the former mill on the bank of the river. Further on the trail goes through a pine forest with a carpet of reindeer lichen. A keen eye will find here the famous orchid – the Lady’s Slipper. This plant is registered in all Red Books of Nature. 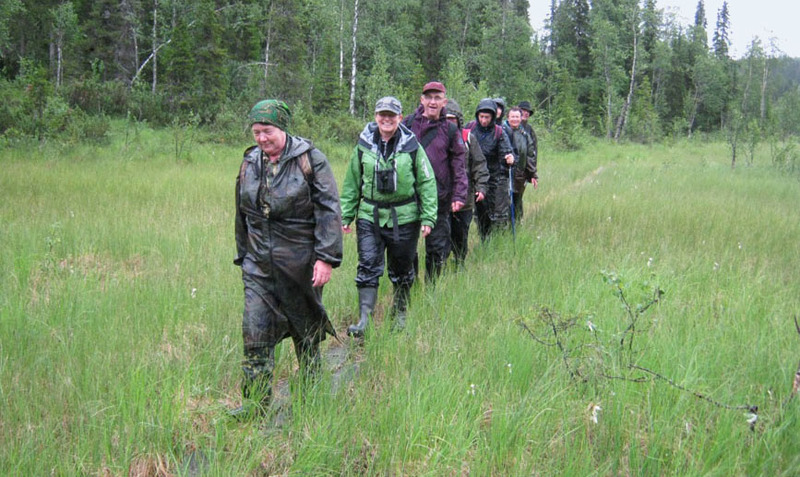 The trail comes to the shore of lake Paanajarvi at the mouth of Mutkajoki river. Paanajarvi lies in a zone of a major tectonic rift. In its deepest part it measures 128 meters. If you make a slight detour at the bridge across Mutkajoki you will see the restored buildings of the former Finnish Aarola farm and read the pertaining information on the boards installed there. The main trail goes uphill to the former state border again and descends to the bank of lake Paanajarvi to finish at the outflow of Olanga river.